First of all, swabs come in different sizes, formats, and materials. You need to pick the right kind for the job. Confused with the huge assortment of swabs available in the market? Learn more about rayon swabs below. Because Rayon Swabs are soft and highly absorbent, they are a good choice for applications where cotton would not be suitable. Rayon Swabs (preferred over cotton swabs) for specimen collection. Swabs are generally thought of as cotton wads wrapped around on one side of a small rod. Did you know that swabs are made with many different materials? Also, a majority of swabs used in the medical field are sterile and often made of synthetic material for better test results without contamination. If you are investing money in a swab, one strong option to consider should definitely be rayon swabs. With so many different kinds of swabs on the market, it can be hard to know which kind is best for your particular applications. Concerned with clinical applications? They are available in varying sizes and formats so that they are compatible with your applications and testing procedures. The shaft of the swab is very important. Make sure that it is made of the highest quality material. Generally, you will have wood, plastic or aluminum as choices. Different shafts materials offer different flexibility and traits. If the application is for nasopharyngeal or pediatric fields, you’ll want to use a rayon swab with an aluminum shaft that is ultra thin and highly flexible. Look out for the swab bud. If it is for clinical purposes, the rayon swab is the best available option. Why are Rayon Swabs Preferred? Since one primary use is for clinics and medical fields, most rayon tipped swabs come wrapped individually so that there is no contamination and the medical results are accurate. Rayon tips made of the top notch quality USP grade rayon fiber. They are easily disposable and most are sterile. Rayon swabs are available with either wooden, plastic, or aluminum shafts and you have the option to choose. A rayon tip swab is also considered the best for gynecological cell collection and for research work. In fact, they are without any odor or taste and thereby ideal for food industries as well. Overall, rayon swabs are better in most cases than other alternative options like cotton. Like Mom always said, you won’t know until you try it. Try out rayon tipped swabs in your applications and see the difference today. If you need assistance selecting the right swab for your needs just get in touch and we’ll be glad to help. 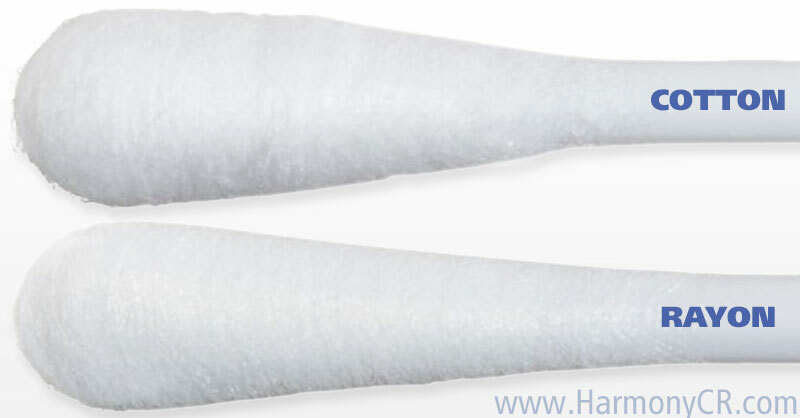 View our selection of rayon tipped swabs here. Next PostNext Why Use Cleanroom Gloves for Critical Environments?